Ex-National Conciliator Juhani Salonius (left. 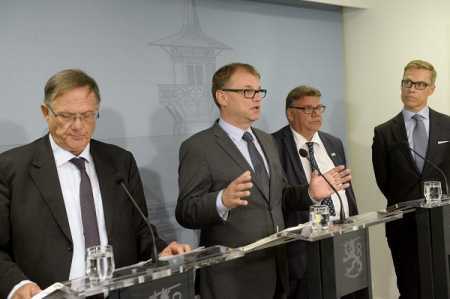 ), Prime Minister Juha Sipilä, Foreign Minister Timo Soini, and Finance Minister Aelxander Stubb at a press briefing after the meeting on social contract negotiations at PM’s official residence Kesäranta in Helsinki on Thursday evening. Photo Lehtikuva. The recent negotiations to reach a new social contract between the government and the labour market organisations failed on Thursday, said an official press release. 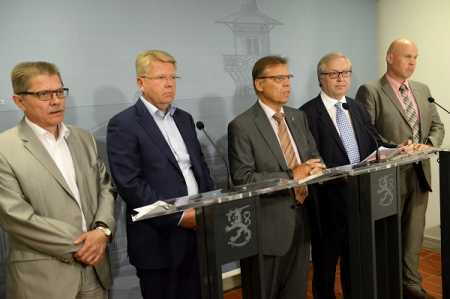 The parties involved in the negotiations led by Prime Minister Juha Sipilä at the Prime Minister’s Official Residence Kesäranta found that there were no grounds for further negotiations. “I am extremely disappointed and sorry that we did not find a common path forward, particularly when the alternatives to the social contract are not at all easier,” remarked the prime minister after the meeting, adding that a serious effort was made to reach an agreement and no stone was left unturned. Sipilä, however, thanked Juhani Salonius for the work he did in exploring possible grounds for a social contract. The government will begin on Friday preparing plans on alternative means to restore Finland’s economy in accordance with the objectives of the government programme. The goal is still to raise the employment rate, improve the country’s competitiveness, return GDP to growth and balance public finances. News agency Xinhua adds: The so-called societal agreement was a key part of the programme of the government that was sworn in this past spring. The government had envisaged a 5 per cent cut in production costs. In the talks that continued until a fixed deadline this week, the workers’ unions were reluctant, for example, to accept longer working hours without extra pay. Described as “internal devaluation”, the plan would have given the country the kind of benefits that were traditionally associated with currency devaluations. Sipilä said this is the first time since Finland joined the euro and Finland must improve its competitive edge in a situation of negative growth. Following the demise of the joint effort, initial government statements indicated the government would start acting alone. Labour market leaders Markku Jalonen (left. ), Jyri Häkämies, Lauri Lyly, Sture Fjäder and Antti Palola after the meeting at Kesäranta in Helsinki on Thursday evening. Photo Lehtikuva. Since 1960s, major economic issues have been worked out together with the labour market sides, and the government played the third partner at the bargaining table. Sipilä said the government will begin working on an alternative programme. Earlier in the spring he had said the alternative would be major further cuts in spending, but he said now other alternatives will be investigated as well. Chairman of the Confederation of Finnish Industries Matti Alahuhta told the national broadcaster Yle that there would have been a need for societal agreement. He said that exports are sluggish and Finland is not interesting as a target for investments. On the other side, the chairman of the largest central organisation SAK, Lauri Lyly underlined that in the future, working life in Finland must continue to be developed on the tripartite basis. From the political opposition, the chairman of the parliamentary group of the social democrats Antti Lindtman said the effort should not have been given up so easily. Lindtman underlined that Finland should not bury its tradition of a society based on agreements, but the government should widen its view on the societal agreement. The chairman of the Green Party Ville Niinistö said the government had consistently been on the side of the employers and the whole process was an effort by the government to make the unions responsible for the austerity policies. Niinisto described centrist Sipila as a “true right wing person”.